Killer whales and boat in Puget Sound. Photo courtesy of NOAA. One of the hot topics at the Salish Sea Ecosystem Conference this week is the impact of shipping noise on marine mammals such as the region's endangered Southern Resident Killer Whales. 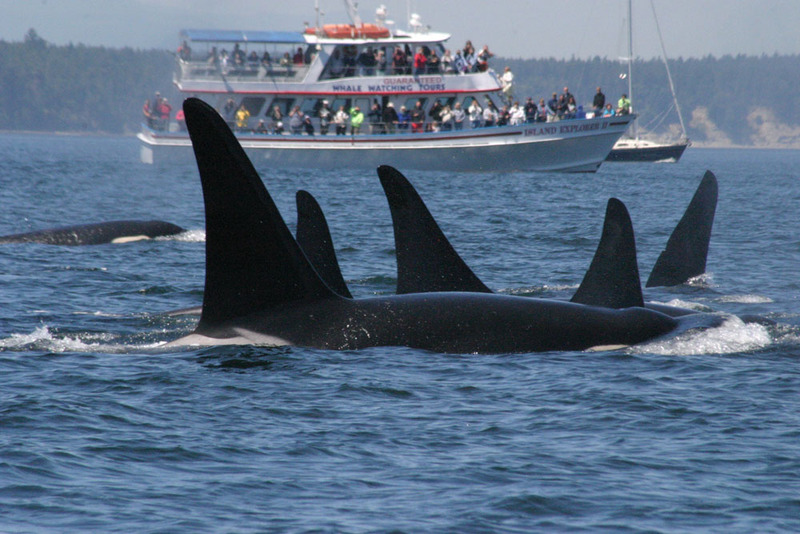 As vessel traffic increases in the Salish Sea, so does chronic noise, which scientists say can alter whale behavior or even mask communication between species. Now scientists are saying that this may be an even bigger issue, affecting species across the board. A session titled 'From plankton to whales: underwater noise and its impacts on marine life' is meant to address this new thinking. I caught up with the session's organizers Kathy Heise of the Vancouver Aquarium and Marla Holt of NOAA for this preview of their Friday session. EoPS: I am struck by the broadness of your session's title. When people think of underwater noise, they might think of whales, but they probably wouldn't think about plankton. Marla Holt:. There is a lot of interest in expanding how we address noise, especially chronic noise. Different habitats have different soundscapes, and we are understanding now that the different influences—whether they are natural or anthropogenic—are really important. This is not only for animals that most people know use sounds, but organisms like invertebrates. They use sounds to do really important things that are related to their life history strategies. Whether it is finding where to settle from larval to benthic stage, or how fish use sound for establishing or maintaining reproductive territories, understanding those behaviors is really important. The first thing you have to do is to understand how they are using sound as a whole. Kathy Heise: It's fish, it's invertebrates. It's becoming apparent that even plankton are impacted by noise. If we do something to reduce underwater noise, we are helping more than just the whales and dolphins. We can be improving water quality for a large number of species. EoPS: Can you explain more how plankton are impacted by noise? Kathy Heise: This is kind of a funny connection, but certain species of plankton are actually attracted to vessel noise and are more likely to settle on a noisy ship than a quiet ship. And from a noise perspective, the more growth on a ship, the noisier it becomes. It's kind of a catch 22. We have to realize how broad the consequences of the impacts can be. EoPS: I imagine we are going to find more examples the more we look. Marla Holt: Yes, absolutely. And a lot of times it is the fact that if you want to find something, you have to look for it. And sometimes that's all you need to do. Even squid are sensitive to sound. It's not hearing in the same way that mammals hear because their hearing organs are totally different, but yes, they are sensitive to acoustic energy. Kathy Heise: My motivation for even putting this session forward was to get this conversation going. Let's get people thinking about it. You can read a desription of the session at the conference website, and we'll have full coverage in our Salish Sea Currents series.